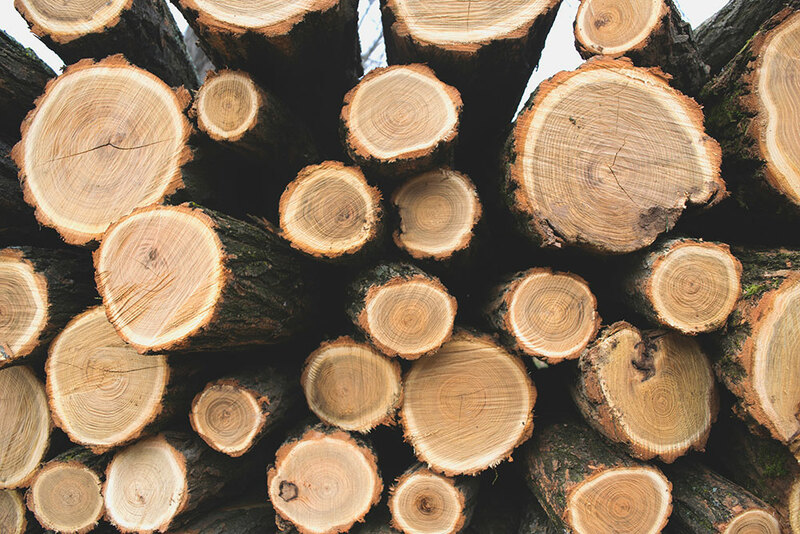 Sun, wind, water and creatures can all be destructive to your log home. From excessive sunshine to persistent carpenter bees, here's how to fight and beat log home natural enemies — the natural way. The sun’s ultraviolet radiation (UV) causes cellular damage on the surface of wood. If these damaged wood cells are not removed, they become a food source for micro fungi. As the fungal growth progresses, the wood becomes darker and eventually begins to rot. Natural solution: Deep overhangs & porches, trees on south and west side of home. The wind is the forgotten enemy, but it does accelerate the drying and cracking of wood, chinking and caulk. Although air helps prevent water damage, it can be a persistent condition in the mountains or desert that hurts more than it helps. The wind has an abrasive effect on the wood when dirt and sand particles are pounding against the surface throughout the year. Natural solution: Plant trees on south and west side of home. Position home on lot to avoid windy conditions. Damp, darkened corners, places under decks, and naturally humid parts of the country have an accumulating negative effect on log walls. Fungus loves damp dark areas and feeds off the wood’s cellulose and breaks down the wood. Natural solution: Plant bushes & plants 3-5’ away from walls, consider stone or brick for part of you wall system. Our furry friends love to make their home in your home and can do great damage to logs in one season. They can also enter your home through a vent and build their nest in your attic space. Natural solution: Keep branches and trees 12 ft. away from building. Prevent them from eating from your birdfeeders. High-pitched metal roofs can help. Woodpeckers enjoy finding insects on trees and log homes and will peck to get at the ones below the surface. Some of these feathered friends just knock on wood (or metal) to attract a mate or stake out territory. Natural solution: Keep insects off your home (see below) and place a fake owl with shiny eyes in your yard. There are a multitude of pests you invade any home, but some especially love a wood home. Carpenter ants, powder post beetles termites and carpenter bees naturally seek wood for food and shelter. Carpenter ants are only around when there is wet, rotten wood , Another reason to keep wood dry. Natural solution: Choose stone over wood for mulch near home, tall foundations make it harder for bugs to get in the home, keep woodpiles 15-20 ft. away and dead trees even further. Put up bug traps for certain pests. When the bottom logs of the home get too close to the ground, moisture, dirt and dark conditions create an environment for mold, fungus and decay. Backsplash from heavy rains or snow piling up against your home adds to this wet situation and can wear away your home’s stain and sealed protection much quicker than the rest of the house. Natural solution: 18-24” foundation with a well drained and graded landscape along with stone rather than wood mulch around foundation. Carefully planted bushes around the foundation (no closer than 3 ft.) can prevent back splash of rain from the ground. Precipitation is the worst enemy of the log home and there are many ways to prevent this culprit from away stealing the value of your home. Cleaning, staining and sealing are a must and need to be done on a regular basis, but there are some preventative measures that can help beat the battle of the winter bulge. Natural solution: Properly working gutters & deep overhangs make sure decks and sidewalks drain away from the home. Look for other places where moisture can be trapped (windows, gas tanks, window boxes) and then create an airspace for circulation. Vertical log wall will naturally shed water better than horizontal walls. These logs can be used in difficult to reach places like upper walls and dormers.